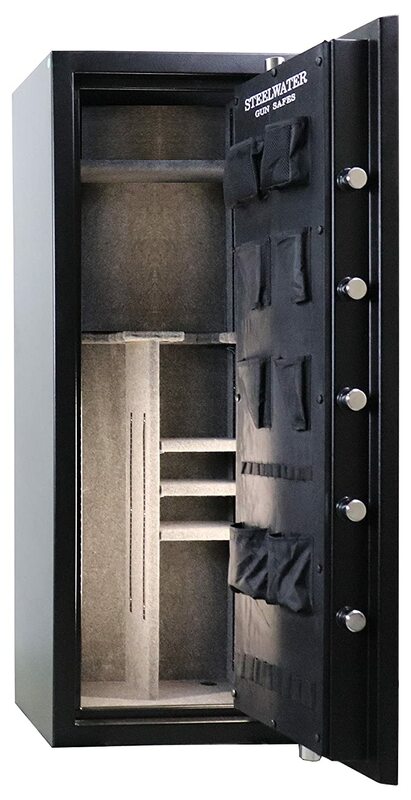 Home Reviews	Best Gun Safe Under $1500: 10 Premium Gun Safe Options! Finding the perfect gun safe at a price that suits you is the key to getting the protection that you need. While some people look for basic, low cost models, others want to spend a bit more on a quality product that they know they will be able to rely on year after year. By paying the right price you will get a safe that has all of the security and features that help to keep your firearms safely out of harm’s way. Yet, this doesn’t necessarily mean that spending a fortune on it. Your premium gun safe options include a range of excellent models for under £1,500. So, what is the best gun safe under $1,500 and what should you expect to find in a good quality model that doesn’t cost the Earth? This is a big price range that covers a good selection of gun safes that offer a range of features you should be happy with. However, there are also some lower quality safes in this price range that are best avoided. Once you start looking at the best gun safes on the market you will see that there are some big benefits to paying more for some extra quality. The following are some of the benefits that you can hope to get when you pay for a model in this price range. What most people want above all else in their gun safe is a strong build. You will want the price you pay to give you a powerful gun safe that intruders won’t be able to access easily. When you look at high quality safe then look to see how long they say that it can keep burglars out for. You should expect a great safe to keep even a determined intruder out for a long time. On the other hand, if you look at reviews of cheaper gun safes then you will typically see that they can be broken into a lot more quickly and easily. In some cases, a low cost model can be forced opened using only some basic tools and without spending too much time on it. There are a few different types of locking mechanism commonly used on gun safes. When you are looking for the best gun safe under $1500 you can expect to be able to choose from the most suitable types of access. The biometric scanner is the best of all of them. This is because you can open the door by letting it scan part of your body to recognize you; typically your fingerprints. This makes life incredibly simple for you, as there are no codes to remember or keys to carry with you. Equally, there is no chance of someone who is unauthorized just opening the door and getting their hands on your guns. A good gun safe with biometric access will also give you a back-up key that you can use to open the door with. This means that you don’t need to worry about getting locked out at any time. An issue that not everyone takes into account is around what would happen to the contents of their safe in the event of a fire. Yet, by looking through your premium gun safe options you will see that you can protect your guns in this situation. The best gun safes will typically offer fireproofing of several hours, while lower cost models won’t have any fireproofing at all. 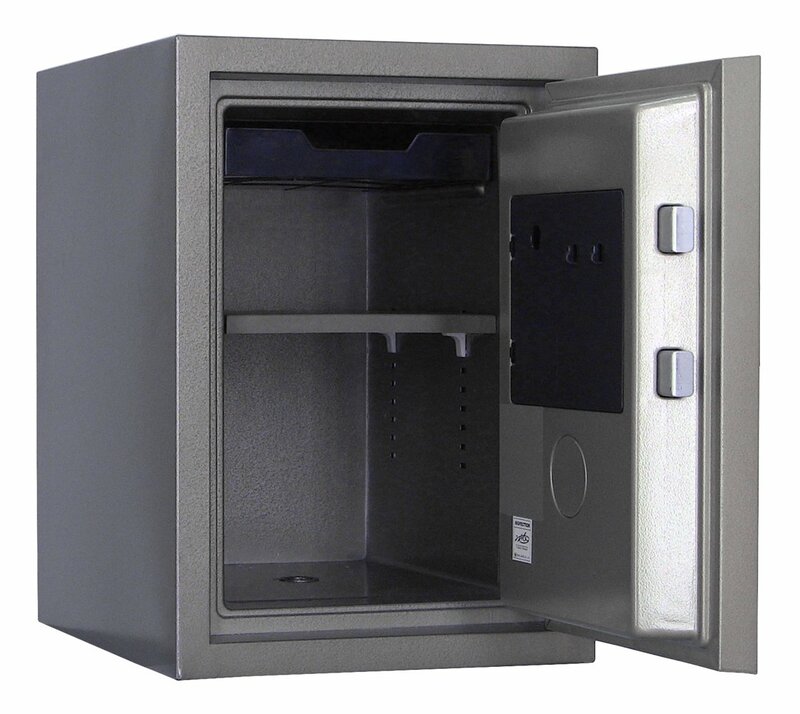 When we look at the range of safes of up to $1500 then you can get fireproofing of up to an hour on some of the most impressive models. Even 30 minutes or an hour of protection could be enough to ensure that the blaze can be tackled before it does any serious damage to what is inside the safe. Of course, this also means that you can choose to use your safe as a place to store cash, papers, and other valuables, as well as your guns. Getting a long warranty is something that gives tremendous peace of mind on any product that you buy. This is especially true with something as important as your next gun safe. Some of the top manufacturers in this industry guarantee that they will fix any damage from an attempted robbery, or replace it altogether if it is stolen. This will allow you to feel completely relaxed about what the future holds for you. The best gun safe under $1,500 for your needs is likely to offer a longer warranty than cheaper models. In some cases, you will even see that safes can come with a full lifetime warranty. We looked at the strength of the safe earlier, and the steel thickness of the walls is a big part of this. Basically, the thicker the walls the more difficult it is for burglars to break it open and grab your guns. Cheaper gun safes will typically have relatively thin walls that offer little protection. They may look sturdy enough but the truth of the matter is that they can be opened relatively easy. If you choose a premium gun safe then look for it to have walls that are genuinely thick and tough. This will make sure that breaking into it is close to impossible, even for someone who spends a lot of time attacking it will tools. In the price range we are looking at here then you can’t expect the very thickest steel to be used. Yet, it should be good enough to look and feel sturdy. Spending more money on your gun safe doesn’t automatically mean that you get a bigger model. Some of the best premium models are designed to be compact, after all. There are also big, cheap safes for sale. Yet, it is true that the most spacious models also tend to be among the premium gun safes. While a lot of cheaper safes are smaller and are designed for handguns, when paying a bit more money you will be able to choose one that is bigger. 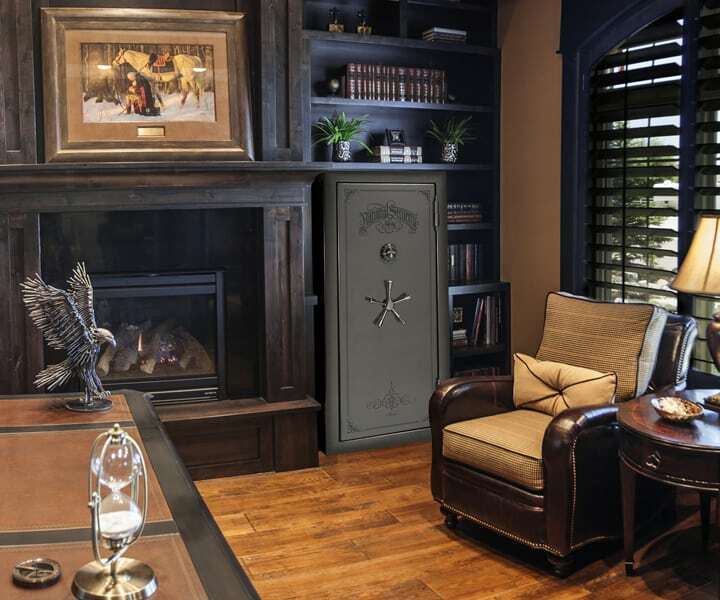 A spacious gun safe will give you the room that you need for a collection that you expect to grow over time. 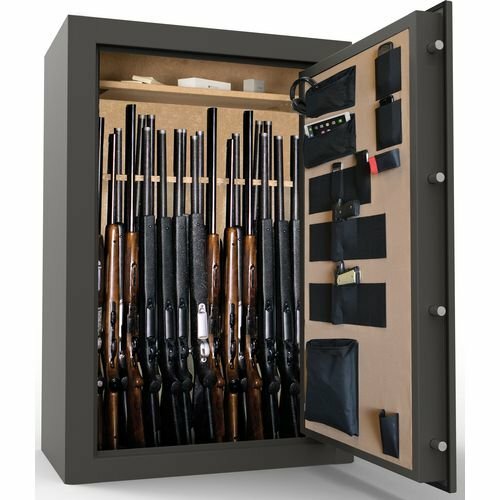 You should look for this sort of safe to have an interior organizer or rifle rack to help you to keep your firearms neatly organized and free from damage at all times. As with most things in life, paying extra money usually gives you access to more features as well. The best gun safes under $1500 will usually offer you some additional benefits that make them worthwhile. For instance, you may get a luxury interior carpet and a courtesy light that let you enjoy opening up the door to take a look inside. These features might not sound like a big deal but they can give you a lot of extra pleasure for your gun safe over the years that you own it. Most additional features like these are nice to have rather than essentials. However, if you are looking at your premium gun safe options then they might just help you to decide which one is best. Bearing the previous points in mind, it is time to consider a few of the best models that you might be interested in buying at a cost of up to $1,500. If you are happy to pay for a premium gun safe but don’t want to spend any more than this then the following are a few of the best options worth taking a look at. This Steelwater Standard Duty 16 Long Gun safe is a high quality option for keeping your firearms safe from harm. It comes with a free door organizer that is of great use in keeping the roomy interior neat and tidy. Among the main changes from previous versions of this safe is the fact that it now offers an hour of protection in the event of fire breaking out around it. It also has bigger 1.5” locking bolts now and interior lighting too. The electronic lock system has a numbered keypad and there is also a back-up key so that you will never be locked out of your own safe. It needs just one 9V battery and the keypad can be reprogrammed with your own code of between 3 and 8 digits. The overall external dimensions measure in at 59” x 22” x 16”. Inside, it measures 55 ¾ x 19 ½ x 12 ½. It technically has room for 16 long guns but has a recommended maximum capacity of 8 to 10. As for its weight, this safe weighs 330lbs. 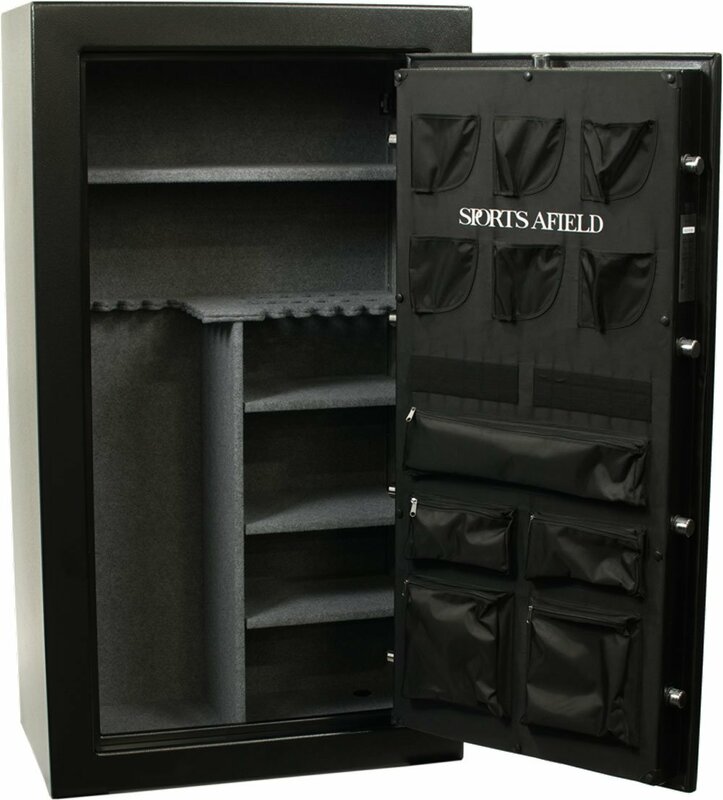 This Sports Afield gun safe is one of your premium safe options that it is worth spending a fairly high budget on. It has keypad access and a backup key to avoid the risk of getting locked out. The keypad is illuminated and also works on silent mode if you prefer this. It can be easily anchored to the floor using additional bolts. In terms of the size, it is 40” x 59” x 22”. This is a big, heavy duty safe that will probably put off many intruders from even trying to break in when they see it. Adjustable shelves let you fit in a larger number of guns very easily and in the way that best suits you. As usual, the ideal number of long guns or rifles that can be comfortably fitted in is a bit lower than the advertised maximum. The Sports Afield Gun Safe is also fireproof for up to 40 minutes at extremely high temperatures. With a lifetime warranty as well, this is the kind of purchase that you can make without any fears. With this Stack-On SS-22-MB-E 22 safe you get a secure place to keep up to 22 rifles or shotguns. The firearms should be up to 54 inches tall in order to fit in here. There is a total of 4 adjustable shelves to let you organize things exactly how it best suits you. The interior is also fully carpeted for a luxurious feel, as well as to keep the guns from getting scratched. You open the door using a quality electronic lock that has a numbered keypad and gives a low battery warning when it is time to change the battery. This Stack-On gun safe weighs 245 pounds and the external size is an imposing 17.6 x 55.1 x 26.8 inches. This means that it is the sort of big, sturdy safe that looks good as well as being very practical. It could be the best gun safe under $1,500 for you if want a good-looking place to keep your firearms that won’t let you down. A limited 3 year warranty gives added peace of mind too. What if you have looked at your premium gun safe options but want something a bit less expensive? With this low-cost AmazonBasics safe you get a reliable place to store your guns at very little cost. It is a 2.1 cubic feet model that is fire-resistant, meaning that you can use it to store more than just your firearms if you want to. The fireproofing is only going to stop the contents from getting damaged for up to 20 minutes at 1200 degrees Fahrenheit (649 degrees Celsius). However, this could be enough time to ensure that your guns or irreplaceable documents are saved from disaster. The body of the safe is made out of 14 gauge heavy duty steel with 5 big 0.75” bolts used to make it extremely tough to break into. 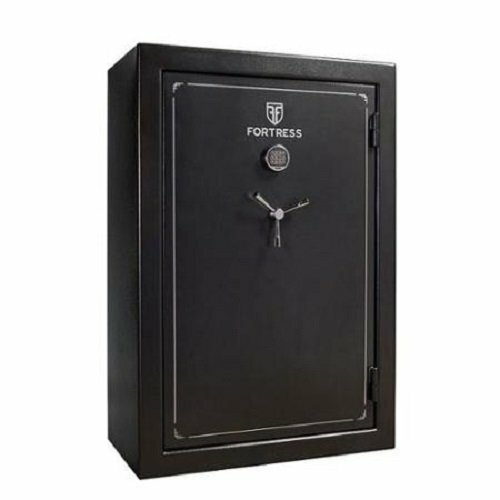 As with many of the best gun safes in this price range, the door can be opened using an electronic keypad and there is a backup key so that you never get locked out for any reason. Inside, there is an adjustable shelf that allows for the storage space to be modified as needed. It also comes with a 1 year warranty to make sure that you are fully protected. The keypad feels a bit lower quality than the rest of the safe. With this Fortress gun safe you can keep your firearms safely stored away in a good quality safe that doesn’t cost a fortune. It has external dimensions of 55” x 20” x 17” and weighs a hefty 226lbs. This safe is advertised as having room for up to 14 guns inside, although you may find that this is more of a tight squeeze then you would like it to be to try and in this number. The fire protection will keep the flames at bay for some 30 minutes, which is a decent amount of time for the price. The lock mechanism uses a keypad and you can also the backup key that is provided to give you another way of getting in when needed. Overall, it is a good choice for a low price. 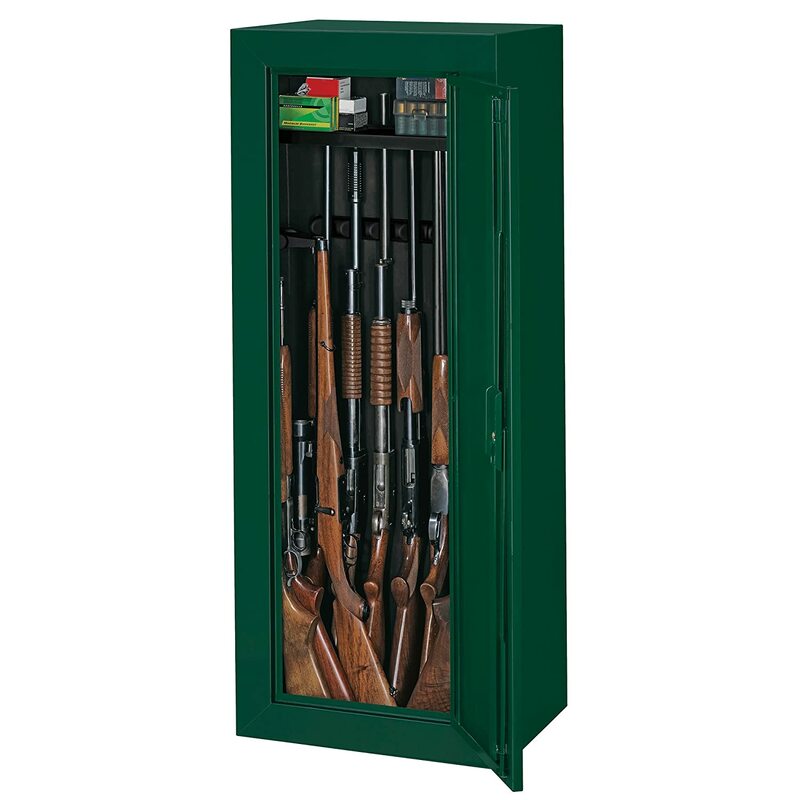 This good value rifle safe is advertised as having room inside for 42 firearms. In truth, there is probably space for half that amount if you want them to be neatly ordered and not crammed together. If there is a fire then the Cannon Safe All Rifle 5936 will keep your guns away from harm for 45 minutes. Inside, it has a nicely upholstered look and there is also a door organizer and shelves to make it easy to use. This model comes with a lifetime replacement promise, which is impressive for a relatively inexpensive gun safe that is sold at well under $1,500. Its dimensions are 59” x 36” x 20”. Some reviewers found the materials used to be of poor quality. 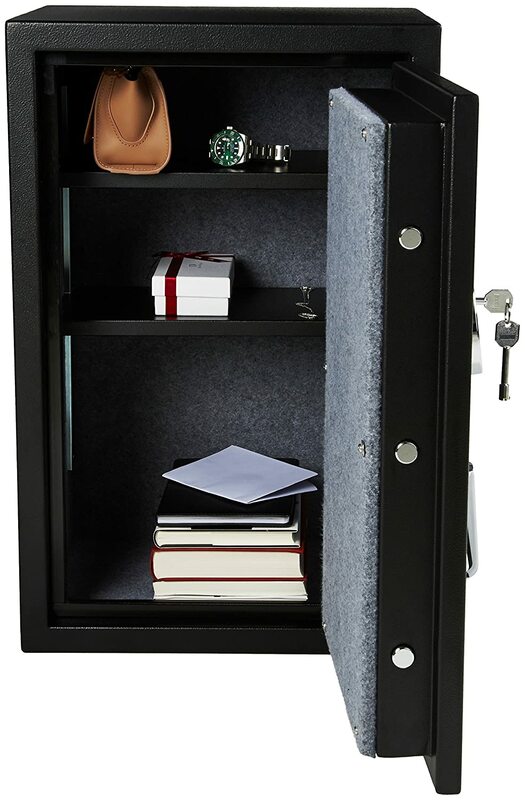 Made out of 18 gauge steel, this Paragon 7501 5 Gun Electronic Lock and Safe isn’t the toughest place to keep your gun, but it can do a decent job of letting you sleep more easily at night. It is opened using an electronic lock that makes life easy for you. Its measures 57” x 14” x 13.75” and weighs 117.5 pounds. This safe is designed to hold a number of rifles in it. It has space for 5 rifles and ammunition inside it. Among its best features are big, heavy hinges and bolts. This is a smart choice of gun safe for someone who wants something better than the most basic models but doesn’t want to spend too much on it. 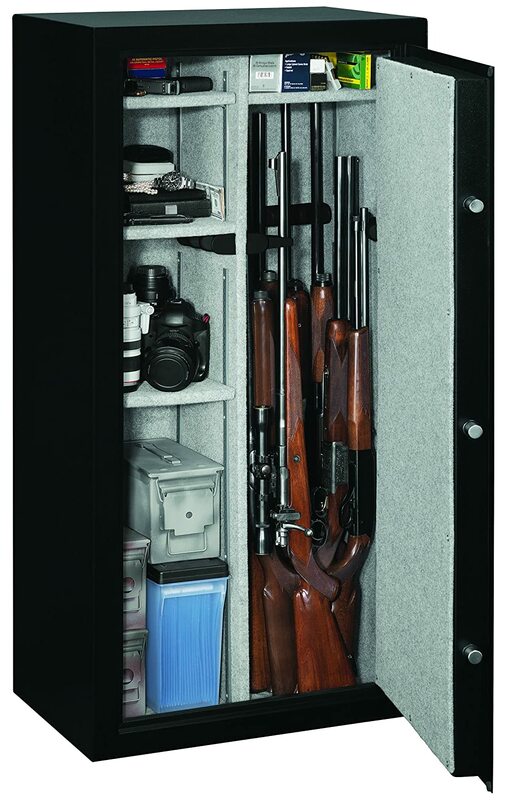 Another gun safe that costs well under £1,500 is the Stack-On GCG-14P. This model is designs to hold up to 14 guns and has a removable shelf for extra flexibility. Firearms of up to 54” can fit in here. The design has a classy hunter green finish with some stylish gold accents. Inside, a foam padded bottom means that your gun should be kept free from scratches. It is a California approved firearms safety device and uses a 3-point locking system with a double bitted lock. The dimensions are 55″ x 21″ x16″. If you want to keep a number of rifles in a reasonable quality safe that costs little then this is a solid option. This tough looking model might be the best gun safe under $1500 if you want to get genuine value for money and no-fuss looks. The Steelwater AMSWEL-500 is 2 hour fire rated, which is very impressive when compared to competitors in the same price range. It is opened with an electronic keypad that is reprogrammable with combinations of between 4 and 16 digits. There is a degree of flexibility inside, with a removable and adjustable shelf letting you put your firearms exactly how you want them to be. The door opens very wide for ease of use. This safe weighs 115lbs. Exterior dimensions are 19 1/4” x 13 ¾” x 16 ¾”. Inside it gives you the following space; 15” x 9 3/8” x 12 1/8”. None that we can find! By looking at gun safes of up to $1,500 you can expect to get a decent quality model that does a good job for you. As you move towards the higher end of this price scale you will notice extra features such as fireproofing and electronic locks. The lower priced model tend to be more basic in appearance and function. If you need a top quality safe keeps items safe from fire for a long time and that is incredibly hard to break into then you may need to pay 2 or 3 times this amount for what you are after. However, if you are after a solid safe that lets you sleep more easily as night then you will find that any model on this list does a good for you.